Welcome to the cyberhome of Dear Mom, Dad & Ethel: World War II through the Eyes of a Radio Man, a hilarious, heartbreaking, and award-winning novel based upon the real-life experiences of my late father and co-author, Eli Ellison, who served in the U.S. Army Air Corps as a fighter control technician in Western Europe from 1943 to 1945. His service took him to London, Normandy, Verviers, Liège, and Germany. Verviers was a cobblestone-street city of about 41,000 near Germany's border in eastern Belgium. It was nearly overrun during the Battle of the Bulge. Liège was an industrial center much larger than Verviers. Liège, on the front lines of the Battle of the Bulge, was a major target for Germany's buzz bombs and V-weapons. To find out more about buzz bombs and V-weapons, click on the "V-Weapons" link on the left. Dear Mom, Dad & Ethel: World War II through the Eyes of a Radio Man is a 2005 winner of iUniverse's Editor's Choice Award and a 2008 winner of iUniverse's Reader's Choice Award. It is also the subject of a popular 2007 Circle of Seven Productions video which can be seen on this website. Dear Mom, Dad & Ethel is a unique blend of familial, wartime letters, romance, and history, chronicling the adventures and mishaps of an ordinary fellow who comes of age in an extraordinary time. It is a story as old as civilization and fresh as today's headlines. The wartime letters are genuine. For a sample of wartime letters, click on the "Excerpts" link on the left, and then click on "Normandy Invasion" and "Battle of the Bulge." 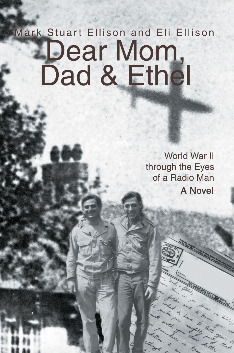 Dear Mom, Dad & Ethel: World War II through the Eyes of a Radio Man is about fate and faith, buzz bombs and saboteurs, love and war amidst breathtaking technological change. Using extensive historical documentation, Dear Mom, Dad & Ethel: World War II through the Eyes of a Radio Man details the local color of civilian and military life during London's "Baby Blitz," France's Normandy invasion, and Belgium's Battle of the Bulge. Readers will vicariously relive the the astounding sexcapades of fighter control squadron sergeant Don Quix in London, Verviers (Belgium), and Germany; his bittersweet love affair in Verviers; an anxious evening in a London tube shelter; and terrifying V-weapon attacks on fighter control squadron members in Verviers and Liège shortly before Nazi Germany's demise. Dear Mom, Dad & Ethel is not about combat, although it contains elements of combat, especially in sections on London's Battle of Britain, the Normandy invasion, Normandy's "Bloody Omaha," Belgium's Battle of the Bulge, the buzz bombs, and V-weapons. But Dear Mom, Dad & Ethel is really about a support soldier on the fringes of history, a loveable rogue wrestling with moral ambiguity, loneliness, lust, privation, and the omnipresent danger of V-weapon attacks. His wartime letters addressed to his parents and sister provide a window into his jaunty, optimistic soul, but they only tell part of the story. The rest is told through anecdotes, character development, and historical background which describe a more complex reality. Please explore the links on the left to find out more about Dear Mom, Dad & Ethel, or click directly below to buy it from the publisher now.